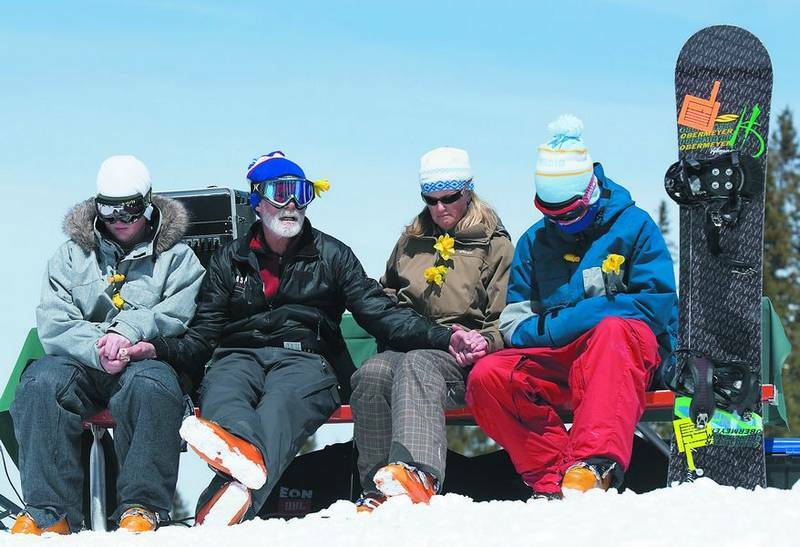 SNOWMASS ” Aspenites came out in force to remember one of their own Tuesday. Far from somber, however, was Tuesday’s ceremony in the Sandy Park area in the shadow of “the Wall” section of Snowmass. It was an area Wallace Westfeldt was known to love. Westfeldt, 22, died while snowboarding the steep cliffs in Tonar Bowl near Aspen Highlands on Friday, April 4. Snowboarders shouted “freedom!” as they turned backflips above a crowd of 300 to 500 people who came out to celebrate Westfeldt’s life. One by one, friends and family took the mic in the open-air cathedral to share remembrances of the adventurous, ever-smiling young man known for a keen sense of humor. “We are absolutely stunned and thrilled and grateful for the outpouring from this community,” said Weems Westfeldt, Wallace’s father and a longtime Aspen Skiing Co. instructor. And shortly before the ceremony, skiers and snowboarders dropped “the Wall” section above Sandy Park, an area that Nancy Westfeldt, Wallace’s mom, called the “playground” where Wallace and his brothers honed their skills. Known as “Turtle” as a young Aspen Valley Ski and Snowboard Club (AVSC) skier (he showed up at a session with an oversized jacket and helmet), Westfeldt broke the mold in a family of skiers and willfully strapped himself to an adult-sized snowboard at the age of 6. It was a move that would take him as far as sponsor contracts and a career as a professional snowboarder until his untimely death. Young snowboarders remembered Westfeldt as a teacher, and friends and family on Tuesday told of Westfeldt’s deep impact on their lives. “This is beautiful,” Skico CEO Mike Kaplan said of the ceremony. At 3:30 p.m., the celebration moved to the base of Buttermilk ski area, where the group filled Bumps Restaurant to capacity. “I come before you as a mother whose world has been torn apart,” said Nancy Westfeldt regarding the loss of her son. But Tuesday’s ceremonies celebrated the spirit of a young man who’s love of life and the mountains that took him will endure, she said. “Wallace will be there with [his brothers] because Wallace is one of them,” Nancy Westfeldt said. Cousins and an aunt and uncle took the podium to honor Westfeldt, and a former snowboard coach, AVSC coach Miah Wheeler, remembered the evolution of Wallace Westfeldt from “Turtle,” the fearless snowboarder kid, to “Wally-do,” the fierce competitor eager to “do” just about anything. “Wally is my new definition of a champion,” Wheeler said. Westfeldt died after dropping a cliff in Tonar Bowl while on a Skico-sponsored film shoot with Denver-based Futuristic Films. He landed on his back in firm snow and suffered broken bones and died of internal bleeding, according to the Pitkin County coroner. But there was no blame or regret during Tuesday’s ceremonies. Weems Westfeldt told the gathered crowd that living in the mountains means that sometimes the mountains “just come and claim one of us” as part of the natural rhythm. “You can’t choose how long you live; you can choose how well you do it,” Weems Westfeldt said. And Wallace chose to live well in his “short, beautiful life,” Weems said.